I strongly believe that a homemade gift or a themed gift are the best kind of presents to give (and to get). For example, when my friend Margie had her bridal shower, I gave her a set of wine glasses paired with some wines named for the occasion. 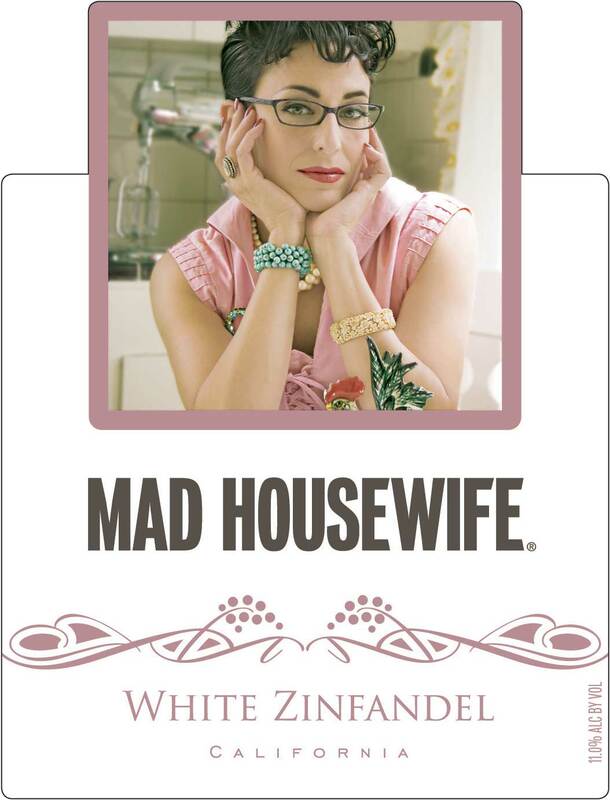 Nothing says bridal shower like wines named Mad Housewife and True Love. My friend Kelly lives in Seattle, and when her bridal shower invitation came, I ordered up some champagne flutes that were delivered to her door. I didn’t want her to worry about getting the very breakable glasses home. I wanted her to have something to open at the shower, so I gave her a bottle of champagne that her and her fiance (who was also at the shower) could enjoy here at home while visiting. [[posterous-content:pid___1]]For my friend Lauren’s bachelorette party, I capitalized on her love of popcorn and designed her gift around the theme of a romantic night in. 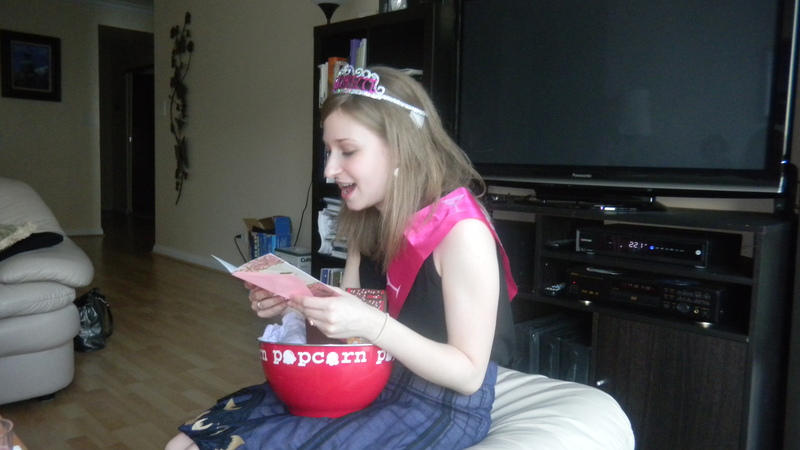 She got a big popcorn bowl, different popcorn seasonings, dark chocolate, a bottle of wine, and a comfy nighty. A few weeks ago, my cousin had a birthday and I gave her a true baker’s gift. 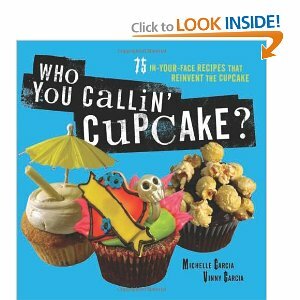 She loves Veruca Salt cupcakes from Bleeding Heart Bakery, so I got her a whole set so she could make her own – a book written by the bakery’s owners that included the Veruca Salt recipe, some cupcake liners, and of course, some Veruca Salt cupcakes themselves. All of those gifts involved just a little bit of creative thinking on my part to get a theme, and I just went from there. But lately, I wanted to start doing more DIY gifts, where I actually make a part of the gift itself. I gave my first semi-homemade gift to my friend Becky over the weekend. When I moved into my apartment with my husband, she brought me what she called a traditional Polish housewarming gift which consisted of a bag of coffee, some salt, and a bottle of wine. To celebrate her new apartment, which I was seeing for the first time, I’d give her the same lovely gift, with a couple twists. Finally, I DIY’d the tote bag to put everything in to give to her, and the tote bag I knew she would use on her grocery trips and on her walk to work. 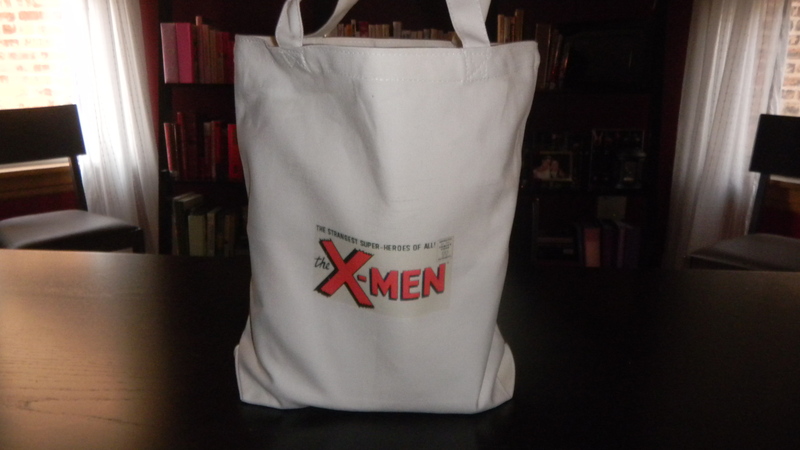 I took a plain natural fiber tote bag and ironed on an X-Men image. Yep, she’s a big comic book fan. Lucky for me, so is my husband and he helped me out by picking out an image for me to use. 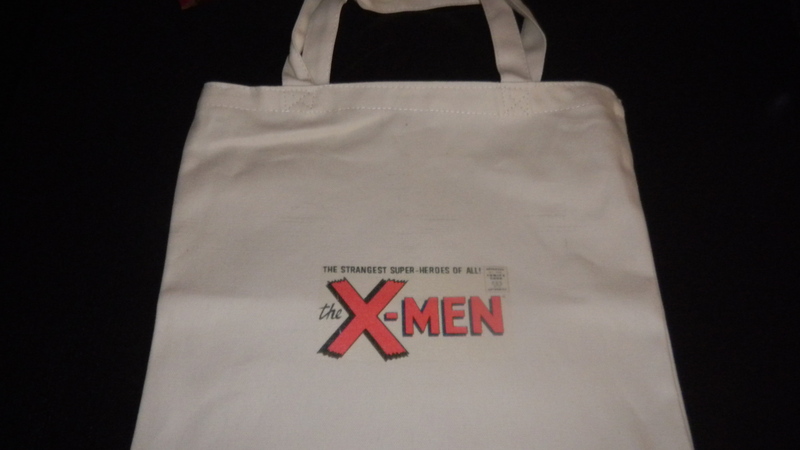 I printed it on some iron on paper, then ironed it right onto the bag. I really liked making it, and even though it was a super easy project to do, I really felt like it added to the gift. Have you ever DIY’d a present for someone else? Yes…..ask Dan about the suitcases I made for his Warhammer collection. I downloaded pictures from the internet and I also think I used some of the pictures off the boxes the figures came in. I bought the cases from a resale shop, cleaned them up and painted them, then decoupaged the pictures on the outside of them. Then, I got foam from Joanne Fabrics for the inside to rest the figures in. They’re in our crawl space now…..you guys could probably sell them on e-bay (meaning the Warhammer figures) for a few bucks !!! !